The Poker Hands iPhone app is a great companion for the novice poker player. In this poker app you will have the opportunity to find out what each hand ranks as far as effectiveness, and also see examples of every possible combination of cards. You can also see the probability of getting that same kind of hand in a real game. Not only that, you can also see rules and information on many other variations of poker that you can play with your friends. You can go from the poker beginner to the master in no time! 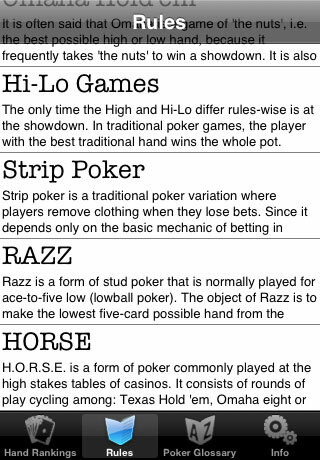 The Poker Hands app is one of those poker apps that would be considered a little pocket guide on how to play poker. You may not want to pull this out while you are in a real game so you don’t look like the donkey, but it would be great to pull up after a game so that you know what you can improve on and learn more about what hands are desirable. For only a buck it’s not a bad investment if you are serious about learning how to play Poker. Voted 3 1/2 stars by iPhone poker app users and currently costs $0.99 to download.